Many of the world's most famous skiers have influenced ski technique and ski resort design. Some have even had a profound effect on world history. During World War II, the 10th Mountain Division was active in mountain warfare in Italy. While they played an important role in the American victory, the unit would have never been formed without the influence of two very important men. It all started with a broken ankle. The story begins on a cold winter day at a Vermont ski area. Charles Minot Dole, otherwise known as "Minnie," was out skiing with a group of friends, when he broke an ankle. At the time, there was no ski patrol. His friends gathered some tin roofing, and created a makeshift toboggan. A few months later, his friend Frank Edson was killed in a ski race. Had there been an immediate rescue unit, Edson's injuries would not have been fatal. Needless to say, Dole was devastated. However, this prompted him to form the Mount Mansfield volunteer ski patrol. Then, in March of 1938, Roger F. Langley, president of the National Ski Association, attended the National Downhill and Slalom Championship at Mt. Mansfield in Stowe, Vermont. He contacted Minnie, and asked if he would be willing to help turn his volunteer patrol into a national organization. Thus, the National Ski Patrol was formed. In 1940, Minnie and a few friends were sitting around the fireplace at Johnny Seesaw's, which was a ski lodge near Mount Bromley. Dole was concerned about the lack of mountain warfare training in the United States army. As the friends discussed the issue, Minnie pointed out that there were approximately 2,000,000 skiers in the United States. He argued that it would be easier to turn skiers into soldiers than soldiers into skiers. His friends urged him to write a letter to President Roosevelt. With a bit of encouragement, Roosevelt eventually agreed. The National Ski Patrol became the obvious place to recruit members of the new 10th Mountain division. When most people think of ski films, they think of Warren Miller. However, the art of ski film making was actually developed by a man named John Jay. In 1935, while attending Williams College in Williamstown, Massachusetts, Jay spent his weekends at the ski area in Woodstock, Vermont. Jay used his family's camera to create his first ski film. When he returned home, he projected his footage for his friends, while narrating the text over the Victrola. When he returned to college, he became the official film maker for New England and New York winter events and festivals. Then, in January of 1942, Jay reported to the 1st Battalion, 87th Regiment at Fort Lewis, where he was made Second Lieutenant to the ski troops, and placed in charge of an eight-man detachment of the 1st Battalion. The troop's successful climb up Mount Rainier won him a commendation. In 1943, John Jay produced a film called Ski Patrol. The film was so popular that it inspired an enormous number of recruits for the 10th Mountain Division. Many Olympic skiers have their moment of fame after they win a race. Some are quickly forgotten. Other famous skiers will stay in our memory forever. Born in Oslo, Sweden, Stein Ericksen embodies everything that is elegant in ski technique. 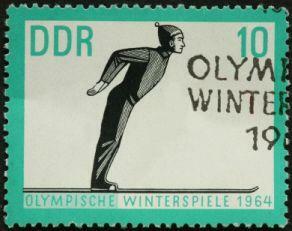 Ericksen won the Gold Medal in the 1952 Oslo Winter Olympics. In 1950, he won a Bronze Medal at the 1950 World Championships in Aspen, Colorado. Ericksen is also credited with creating "aerials," which is a freestyle skiing event. He moved to the United States in 1952. Erisksen is currently the director of skiing at the elegant Deer Valley Resort. He also serves as host at Deer Valley's Stein Ericksen Lodge. Many people believe that Ericksen is skiing's first superstar. He is handsome, charming and charismatic. However, despite his assets, rumor has it that he is quite humble. There's no doubt that Bode Miller is one of the world's most famous skiers. His fame is based partly on his Olympic successes. However, in contrast to Ericksen, his somewhat controversial attitude often makes the headlines. Born in Easton, New Hampshire, former US Ski Team member Bode Miller is a four-time world champion in four different skiing disciplines. Boasting 31 World Cup victories, he is considered to be the most successful American skier.